Thunderground is here! 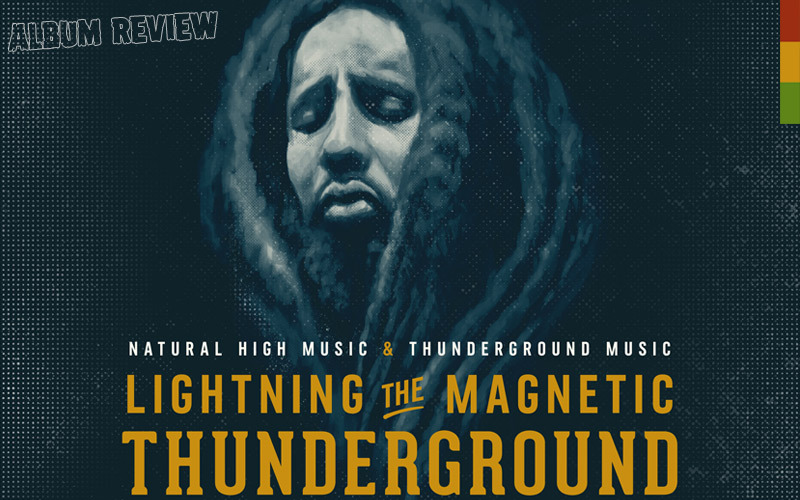 After his 2012 solo-debut The Lost Tracks, the long-awaited new album of Lightning The Magnetic aka Stephen Newland aka lead singer of Rootz Underground was released on 4/20 and has attracted quite some international attention already. Produced by Natural High Music, Stephen Newland and his own label Thunderground Music, the album is a daring experiment from the first note to the last. Yes, it definitely has a heavy Roots-core, but its instrumentation and vocalisation as well as the careful use of surprising effects and the more generous use of Dub elements make it a thrilling discovery-trip. Remarkable is also the arrangement of the tracks: in a smooth transition, the end of one leads over to the beginning of the next without a complete break. And, as the three interludes herald what's coming, the listening experience is best when following the track-list from 1 to 12. Somehow, the artist succeeded in making every song come alive with an individual characteristic that goes beyond the stylistic variety of the release, almost personifying each piece. Thus, after a Nyabinghi intro ringing with the words of Ras Ronald Kerr, there is the pious ascetic One Thing, transporting its message on a plain, drum & bass dominated riddim that's added to by featuring the honourable Jr. "One Blood" Reid. Introduced by yet another Nyabinghi interlude which slowly gains in volume to drown the noise of an amusement park, Circus Music is a courageous orator, pleading with all Rasta children to come together. The rebel among the tracks is Out Di Box, which not only invites you to think out of the box but stands out by a very unorthodox vocal performance of Stephen as well. Seeing "visions in the corner of my mind", Signs Of The Times presents itself as a fierce prophet, while Truth That I Know inspires the picture of a wise old man passing on his knowledge. Least Reggae of all, Hard Drive reminds me of an eccentric artist who goes new ways both musically and lyrically, teaming up with the wording genius of Vaughn Benjamin. Accompanied by a minimalist acoustic melody, Long Time is a ghetto youth describing the difficulties of life under non-ideal circumstances, made credible by yet another impressive testimony of Newland's voice. Which persona is still missing? Of course, the herb-loving natty Dreadlock! Free, wild and strong, the Tra-La-La-La Dub evokes his image in perfect clarity, playing with above-mentioned Dub elements that require big speakers to be enjoyed to the fullest. The last character introduced is a pacifist standing firm to his convictions in the face of global warfare. Cleverly playing with the double meaning of the word "arms", Stephen Newland again proves his creative potential both in text and timbre in These Arms, its poignancy balanced by the sweet voices of Yasmine Brown and Sarah Silvera. Monk, rallying caller, rebel, prophet, wise man, artist, ghetto youth, Rasta man and pacifist – Thunderground certainly brings out the best of Stephen Newland, bestowing on the world a timeless musical legacy that bravely crosses songwriting traditions and shows us how exciting new music can be when talent meets an exploratory mind.